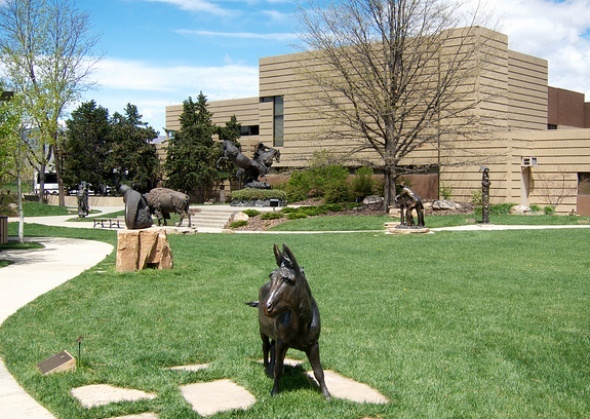 The Leanin’ Tree Museum and Sculpture Garden of Western Art displays more than 400 paintings and sculptures from more than 100 artists. The collection was assembled by Ed Trumble, founder of Leanin’ Tree greeting card company, fulfilling his vision of creating an important array of fine art of the American West by contemporary artists. The museum is located in the Gunbarrel area about 15 minutes northeast of Boulder. It’s just two blocks north of the Celestial Seasonings tea factory. Admission is free, and many of the sculptures are located outdoors in a garden.